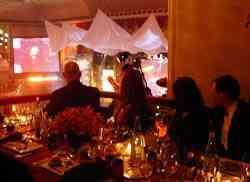 As fans at home watched the TNT television coverage of the NASCAR Nextel Cup Award Banquet from the Waldorf-Astoria Hotel in New York City, all eyes were fixed on a the main table where Tony Stewart and his #20 Home Depot team earned their place as the 2005 Cup champions. Actually, it was just the final great moments of many that took place all week long. After taking part in the annual Myers Brothers Breakfast on Friday morning, the champions and their mates had a little free time before the banquet. Many rested after a lively evening of nightlife on Thursday. Others, like NASCAR Southwest Series champion Jim Pettit, took in a few of the sights of NASCAR. Petit, his wife Veronica, NASCAR’s Jason Bates and Paul Schaefer and yours truly went to the “Top of the Rock” on Friday afternoon. This is where the sights of Manhattan could be viewed from 67 stories up in an outdoor area above Rockefeller Center. The group joined up with Midwest Series champion Justin Diercks and his girlfriend Kelly for genuine New York pizza at lunch. Other drivers went their separate ways as well. For example, Busch North champion Andy Santerre and his wife found that the going rate for a lunch of burgers and fries at T.G.I Friday’s in Manhattan was in the $50 range. The scheduling break was designed by NASCAR to give the champs a little bit of a breather before the actual banquet. They earned it after a whirlwind tour of dinners, press conferences, photo shoots and even a little bit of partying during the week. The drivers appreciated the free time. After some time for the ladies of the group to pretty themselves up even more, and the champions themselves to look better than presentable, it was time for the Nextel Cup banquet ceremonies and more VIP treatment. 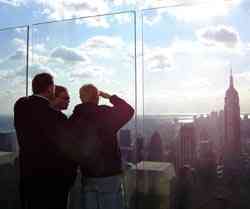 Southwest champ Jim Pettit, NASCAR's Jason Bates and NASCAR's Paul Schafer enjoy the sights of New York from 67 stories above the ground. What the fans at home did not see were two tables made up of 11 other NASCAR Champions for the 2005 season. That is where racers who hailed from Downeast Maine to oceanside California and everywhere in between enjoyed the company of their fellow champs, the hospitality of NASCAR and the pride in their accomplishments quietly, well maybe, not so quietly, after a busy stretch of several days. 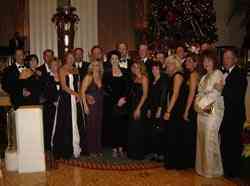 The Nextel Cup banquet was the final formal event of NASCAR Champions Week and the touring champions were definitely not forgotten. Kyle Busch accepted the first award and the night for being the top rookie in Nextel Cup and he noted the champs in his acceptance speech. It was only the first time in a long evening where the champs got their due. Everyone was impressed, but not entirely surprised, with the festivities. retirement year. Seeing Wallace take to the stage for the final time was emotional for everyone. After all, these guys might be champions, but they are also fans of the sport they love. And watching Tony Stewart make his acceptance speech as this year’s Nextel Cup champion to end the evening gives these racers something to shoot for in the future right? The champs watch Gavin DeGraw , one of the muscial guests at the banquet. 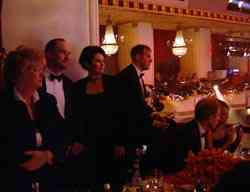 The champs watch the festivities on stage in the Grand Ballroom at the Waldorf-Astoria. short in the points this season yet were in New York for another special reason and our trademark 51 leftovers, which will also include a special section devoted to one driver who had so many interesting experience during the week that he’ll get his own story. Which driver is that? Stay tuned.